In April last year £30m worth of heroin was seized at a motorway service station in Kent - believed to be the largest amount ever seized by UK police. Three men behind it were jailed for a total of 55 years on Monday. 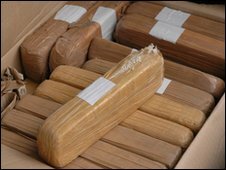 On 3 April 2008 Patrick Kuster borrowed his mother's car, loaded it with 13 boxes of heroin, weighing a total of 330.7kg (727lb), and drove it through customs at the port of Dover. At around 1pm the Dutchman was waved through with his cargo, worth an estimated £33m on the streets of Britain. He must have breathed a huge sigh of relief. Kuster drove to a service station at Maidstone, where several couriers were due to meet him and pick up part of the consignment on behalf of various syndicates. At 3.40pm Kuster's good fortune came to an end when police swooped on him and a man called Harminder Chana, who was collecting on behalf of a London gang. A third man, Atif Khan, was arrested later that day. Detective Inspector Marion Ryan, of the Metropolitan Police's Central Task Force, takes up the story: "Kuster was not the original object. We were targeting other members of an organised crime network." She said Khan and Chana were under surveillance, following intelligence which had been received about them being involved in drug smuggling. Det Insp Ryan said: "We were not expecting such a huge amount of heroin in one delivery. 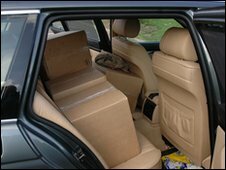 The boot was full and the car was laden up to the roof with brown boxes. They were even in the front seat." She said: "The purity was quite high and it would have been enough to keep 8,000 addicts supplied for a year." This week the final defendant in what became known as Operation Frant, Abdul Matalib Shammin Rob, 30, of Ilford, east London, was convicted of conspiracy to supply heroin. Although Rob was not present, mobile phone evidence proved he was part of a syndicate who had bought 48.7kg (107lb) of the heroin, worth around £3m. Jeremy Carter-Manning QC, told Rob's trial at Kingston Crown Court: "The imported consignment appears to have been destined for at least three consortia or individuals." Kuster was jailed for 26 years. Chana, 32, was sentenced to 17 years, Rob, 30, to 23 years and Khan, 34, to 15-and-a-half years. Sentencing the men at Kingston Crown Court, Mr Justice Corcoran said heroin was a "pernicious" drug, adding: "It is interesting to note that those higher up the chain seek to distance themselves from the actual importation and handling of the drugs." Mr Carter-Manning said that after Kuster and Chana's arrest, police went to a house in Beckton, east London and found equipment "which was clearly of use in the preparation of large quantities of heroin for onward re-sale and supply". Mr Carter-Manning said this included mannitol, a cutting agent for heroin, scales, paper and foil, gloves and a "virtual smorgasbord" of drugs in plastic bags. A second "safe house" was later found near London City Airport. Rob, who was only arrested in November 2008, had called Khan 26 times in a 45-minute period after Khan's arrest and sent a text which said: "I'm looking so stupid, 4 one hour they keep calling asking how long and I ain't got an answer cos u r not picking up." The dealers who Rob had clearly promised his drugs to were clearly not happy with him. At his trial Rob claimed his frantic calls were connected to an accident which somebody had suffered at a factory he owned but this story was a fabrication. Kuster, a former lorry driver with the Dutch firm Nedexco, had been acquitted previously of another conspiracy in which drugs were smuggled in buckets of mayonnaise. But on 3 April 2008 he was just "bluffing his way" through customs, said Det Insp Ryan. "He was on a bit of a suicide run," she said, adding that he claimed he had only been paid 500 euros for the trip. Det Insp Ryan said: "Rob and Khan were investors who stood to make a lot of money. There were clearly other criminal Mr Bigs who put up money but stayed well clear of the drugs." Hearings under the Proceeds of Crime Act will now seek to confiscate assets belonging to Rob and Khan and an investigation is still ongoing in the Netherlands into the supplier. Det Insp Ryan said: "It was highly significant because it would have had a huge impact on the organisers. They will have already paid up and it will seriously disrupt their activities."